The Supplemental Nutrition Assistance Program (SNAP) provides monthly benefits that help eligible low-income households buy the food they need for good health. For most households, SNAP funds account for only a portion of their food budgets; they must also use their own funds to buy enough food to last throughout the month. Eligible households can receive food assistance through regular SNAP or through the Louisiana Combined Application Project (LaCAP). For more information on SNAP and other services available through the Department of Children and Family Services (DCFS), call 1-888-LAHELP-U (1-888-524-3578). SNAP participants may also meet the income eligibility guidelines for nutrition services through the Women, Infants & Children Program (WIC) offered by the Louisiana Department of Health. Learn more about WIC and find out if you qualify. Budget sheets are frequently used by other organizations as proof of SNAP benefits. Print your Budget Sheet by accessing your account in CAFÉ. To get benefits through regular SNAP, households must meet certain tests, including resource and income tests. Resources: Individuals who receive Supplemental Security Income (SSI) or households including anyone who receives Family Independence Temporary Assistance Program (FITAP), Kinship Care Subsidy Program (KCSP), or Strategies to Empower People (STEP) Program benefits are exempt from the resource limit. Households not exempt from the resource limit may have up to $2250 in resources, such as a bank account, cash, certificate of deposit (CDs), stocks, and bonds. Non-exempt households that include at least one household member who is age 60 or older or includes a disabled member may have up to $3500 in resources. The household is disqualified for failing to comply with work registration requirements. An individual who is on strike. Income: Households must meet income tests (unless any member is receiving FITAP, KCSP, STEP benefits, or all members are receiving SSI). Most households must meet both the gross and net income tests, but a household with a person who is 60 years old or older or a person who is receiving certain types of disability payments only has to meet the net income test. Gross income means a household's total, non-excluded income, before any deductions have been made. Net income means gross income minus allowable deductions. Households, except those noted, that have income over the amounts listed below cannot get SNAP benefits. Allotment Amounts: The amount of SNAP a household receives depends on the number of people in the SNAP household and the amount of their net income. The table below shows the maximum SNAP allotments by household size. Identity - Individuals must show proof they are the person they claim to be. Applicants must provide proof of their identity. Residence - the client must be living in Louisiana. Citizenship - household members can include either US citizens and/or certain aliens with verifiable USCIS documentation. Enumeration - households must provide or apply for Social Security numbers for each member before certification. (By clicking here you are NOT completing an application for SNAP benefits; instead, you are completing a pre-screening tool that can be used to help determine if you may be eligible to receive SNAP benefits. Application for SNAP benefits must be made at your local DCFS office). Visit the federal Supplemental Nutrition Assistance Program online and view the federal requirements for food assistance in several languages. LaCAP is a food assistance program for Louisiana residents who are at least 60 years of age and receive Supplemental Security Income (SSI). It is a simplified version of SNAP. If you are eligible for LaCAP, you will receive a Louisiana Purchase Card and SNAP benefits will be automatically deposited into your account every month. There are three standard allotment amounts in LaCAP. Depending on shelter costs, LaCAP participants will receive $35, $82, or $173. LaCAP cases are certified for 36 months. Are not institutionalized or otherwise ineligible for SNAP benefits due to immigration status, or an Intentional Program Violation. Are not living with your spouse or own child who is under 22 years of age. Fill out the application (LaCAP Enrollment form1A). After DCFS receives your application,you will be assigned a worker who will determine your eligibility. DCFS will send you a letter within 30 days of the date we receive your enrollment form to let you know if you are eligible or not. If you are eligible, the letter will also tell you the amount of your benefits and when they will begin. Seniors receiving SSI who need food assistance do not have to use LaCAP. Food assistance is available through LaCAP or through regular SNAP. If you receive benefits through LaCAP and you want to change to regular SNAP, you can do so at any time. Pay more than $552 per month for shelter costs. Fill out an Application online. You can also apply for the Family Independence Temporary Assistance Program (FITAP) or Kinship Care Subsidy Program (KCSP) with this application. You can also download an application and fill it out by hand. Gather the documents you will need to verify the information in your application. What must be verified and examples of proof. If a face-to-face interview is requested, you may schedule an appointment with any DCFS parish office. *Households composed entirely of people who are applying for or receiving SSI may apply for SNAP benefits through regular SNAP at the Social Security Administration office unless they already have a SNAP application pending. Benefits depend on both the number of persons in the household and the net monthly income amount remaining after all allowable deductions have been subtracted. Standard Deduction - $164 for 1 to 3 household members;$174 for 4 household members; $204 for 5 household members and $234 for 6 or more household members. Medical Deduction - allowable medical expenses incurred by elderly or disabled household members in excess of $35 per household. Dependent Care Deduction - payments for the care of a child or other incapacitated adult which are necessary for a household member to work, look for work or attend school or training. Child Support Deduction - allowable for payments of legally obligated child support. Shelter Deduction - allowable shelter costs (rent or mortgage, property taxes, insurance on the structure and utility expenses) in excess of 50% of household income remaining after all other deductions. For households with an elderly or disabled member, there is no limit on the shelter deduction; for all other households, the shelter deduction cannot exceed $552. How are My Benefits Issued? Electronic Benefit Transfer (EBT) is a method of delivering governmental benefits to recipients electronically. Louisiana uses magnetic stripe card technology. 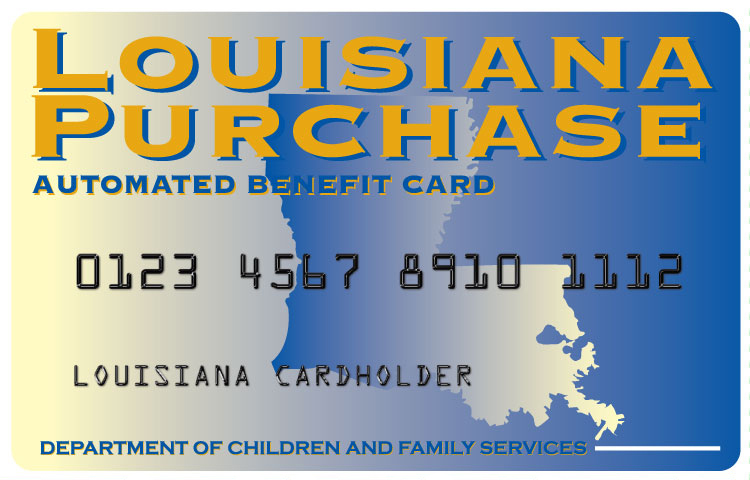 The card, which is referred to as the Louisiana Purchase Card enables recipients to access benefits at Point-of-Sale (POS) machines. SNAP benefits are posted to the recipients account during the first fourteen days of the month. Recipient benefits are accessible by 5:00 a.m. the morning after they are posted. Benefits are posted on the same date every month regardless of the day of the week. Holidays and weekends do not affect the date of benefit availability. In emergency situations, benefits are available immediately. Benefits are secure and accessible only to persons authorized by the recipient. The Personal Identification Number (PIN) is selected by the recipient and must be correctly entered in order to successfully complete all electronic transactions. As purchases are made at grocery store checkout lanes, recipient accounts are debited and the recipient is given a receipt which provides the remaining account balance. Seeds and plants which produce food for the household to eat. In general, food products that contain alcohol or tobacco, items that are not intended for human consumption (e.g. paper products, pet foods, etc. ), vitamins and supplements, and foods sold hot at the point-of-sale, are not eligible for purchase with SNAP benefits. The USDA provides nutrition assistance to those most affected by a disaster or emergency. When the State of Louisiana notifies the USDA of the types and quantities of food that relief organizations need for emergency feeding operations, supplies are provided to disaster relief organizations such as the Red Cross and the Salvation Army for mass feeding or household distribution. The USDA also authorizes States to provide D-SNAP benefits if certain conditions are met. Receive an application when you ask for it. Turn in your application the same day you receive it. Receive your SNAP benefits (or be notified that you are not eligible for the program) within 30 days after you turn in your application. Receive SNAP benefits within 7 days if you are eligible and have little or no money. Have a fair hearing if you disagree with any action taken on your case. A program complaint may be filed with the Department of Children and Family Services (DCFS) by emailing DCFS.Webmaster.DCFS@LA.GOV or by calling 225-342-2342. You may file a civil rights complaint with the Department of Children and Family Services (DCFS) by completing the Civil Rights Complaint Form. Turn the form in at a local office; mail it to DCFS Civil Rights Section, P.O. Box 1887, Baton Rouge, LA 70821; email DCFS.BureauofCivilRights@LA.GOV, or; call (225) 342-0309. You may file a civil rights complaint with DCFS and USDA or only DCFS. View the full non-discrimination statement here. This program was established by Congress in 1964 by PL 88-55 which was superseded by the Food Stamp Act of 1977 and subsequent amendments to the Act. It is administered at the federal level by the U.S. Department of Agriculture - Food and Nutrition Service and at the state level by the Department of Children & Family Services. Besides certification and issuance activities, the Food Security Act of 1985 mandated that employment and training services be provided for SNAP recipients who are mandatory work registrants. The employment and training activities, known as the Louisiana Job Employment Training (LaJET) Program, are accomplished through the cooperative efforts of the Supplemental Nutrition Assistance Program (SNAP), the DCFS parish offices, (in parishes where available) local governing authorities in the State and the Louisiana Workforce Commission. The Personal Responsibility and Work Opportunity Reconciliation Act (PRWORA) of 1996, which was signed into law on August 22, 1996, implemented many changes in SNAP, including a limit on the number of months certain persons can receive SNAP benefits without working.